Pivot points are used strategically to catch support and resistance points, thus, helping in identifying areas where reversal of price movement is possible. Support and resistance points attract the maximum amount of buying and selling. As the name suggests, the support is something that prevents the price from falling further. The support level is a price point on the chart where traders expects maximum demand (in terms of buying). While resistance level is a price point that prevents price from rising further and hence acts as a maximum selling point. If the stock opens above P and crosses R1, then one can buy with the target set as R2. If the stock opens below P and crosses S1, then one can short with the target set as S2. The key thing to remember though is that these are purely intraday levels and change every day when there are new closing prices for the day. 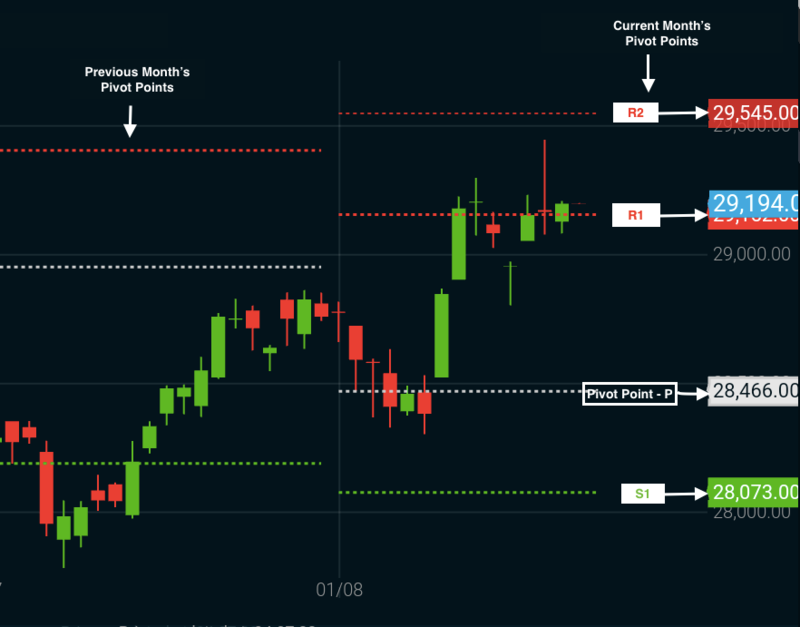 How traders use Pivot Points? The pivot point sets the general tone for price motion. A move above the pivot point (P) indicates strength with a goal to reach the primary resistance, R1. A smash above first resistance suggests even more strength with a goal to the second resistance level, R2. Similarly, a move below the pivot point shows weakness with a target to S1. A break below S1 shows even more weakness. Like we mentioned before, a downward movement will indicate bearish and upward movement is sign for bullish. Traders decide based on the pivot point, when and where to enter or exit the market. For instance, if you see that the price is breaking at resistance level (R1) then I will put a limit order to buy 500 shares. If the same trend applies to support level (S1) then I will set a stop-loss. So, you see that pivot point technique is very efficient and is useful for traders to predict market movement. But how far you succeed in capitalising this depends on how well you can use this with other technical indicators. ट्रेडर्स पिवोट पॉइंट्स कैसे इस्तिमाल करते हैं ? NOTE: This article is for educational purposes only. Kindly learn from it and build your knowledge. We do not advise or provide tips. We highly recommend to always trade using Stop Loss.